No matter who you are or what difficulties you’re facing, you can empower yourself to have the body you want to have, become the person you want to be, and live the life you want to live. That’s why I wrote a new book, called The Little Black Book of Workout Motivation. Have you ever gotten into your car after a long day at work, and even though you promised yourself you’d hit the gym, you head straight home for the couch instead? Have you ever been unable to stop hitting the Snooze button every morning (instead of the gym)? Have you ever been secretly afraid that you just don’t have what it takes to really change your body and life? Have you ever struggled so much to build a better body and life that you wondered if it’s really worth it? If you answered “yes” to any of those questions, I understand. I’ve been there myself. Years ago, I was stuck in a rut in the gym, I was making minimum payments on tens of thousands of dollars of credit card debt, and I had no idea where I should go in my life, let alone how to get there. Today, I’m a “super-fit” bestselling author with over one million books sold, and the owner and co-founder of several 7- and 8-figure businesses, including Muscle for Life, Legion Athletics, and Oculus Publishers. How the hell did all that happen? Did I sell my soul to the Dread Lord Cthulhu? Discover the one weird trick to melting belly fat, debt, and existential angst. . . in just 5 minutes per day? Develop an expensive but highly productive cocaine habit? I read scores of books, worked thousands of hours, and overcame more setbacks than I can count. In other words, I did the hard stuff that most people don’t want to do, and I’m ready to share the biggest lessons I’ve learned along the way. And now, while I don’t know everything about personal growth, I do know what it takes to develop the skills, habits, and spirit required to transform your body and life. I also know that anyone can use these powerful strategies to overcome the biggest mental and emotional blocks holding them back from realizing their potential in the same way that I have. No matter who you are or what difficulties you’re facing, you can empower yourself to have the body you want to have, become the person you want to be, and live the life you want to live. 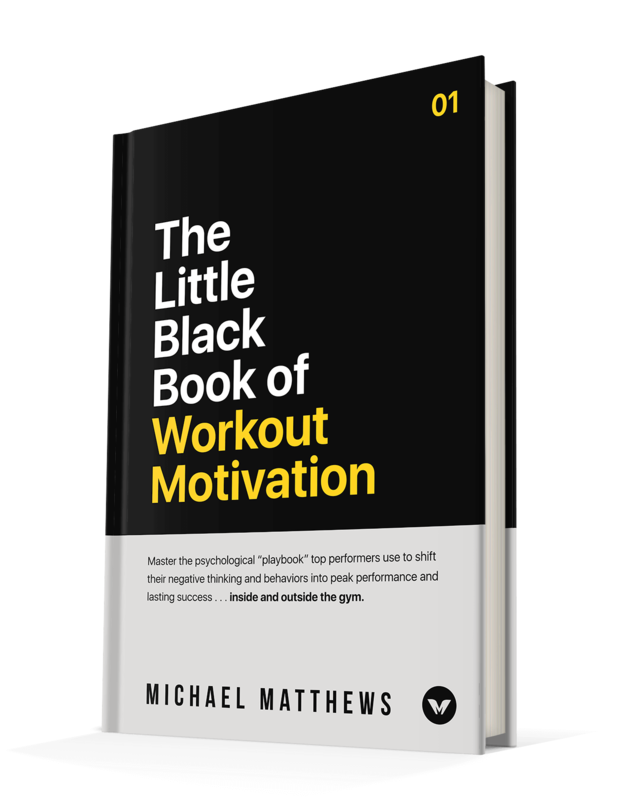 That’s why I wrote a new book, called The Little Black Book of Workout Motivation. It’s my personal—and 100% practical and hands-on—blueprint for personal transformation, inside and outside of the gym, and it will provide you with new and valuable knowledge and skills that you will use for the rest of your life. In short, I wrote this book to help you fix the important things that are holding you back from doing and achieving the things you care most about. To do that, I share wisdom and insights from hundreds of scientific studies and scores of legendary artists, authors, entrepreneurs, philosophers, generals, and conquerors, as well as my own biggest “a ha” moments that are most responsible for where I am today. Armed with the information you’ll learn inside my new book, you’re going to start living life with more energy, enthusiasm, and nerve. You’re going to develop a new paradigm for interacting with yourself and your environment. And if you really take these lessons to heart, you might just enter a transformative period of your life and discover that you’re capable of far more than you ever thought possible. So, don’t miss this golden opportunity to learn what most people will never know about developing the mindset, skills, and determination required to win, inside and outside of the gym. P.S. I’m also giving away over $5,000 of great stuff to celebrate the launch of the book, including . . .
All you have to do for a chance to win is order the book and forward the receipt to [email protected], and voila, you’re entered to win. P.P.S. I worked my hiney off writing this sucker and am very curious how you, dear reader and follower, like it. Please do share any and all feedback that you have, good and bad. I’m all ears.